Having rested since July, over the summer, we had a rethink after 18 months of URBAN Lifeclass Seminars and created smaller, more intimate EVENING BREATHWORK GROUPS in October, which proved very successful, so much so that the first one in November is FULL and and only 2 places left for the second November date, Tuesday 24th. 7-10pm Euston Venue. 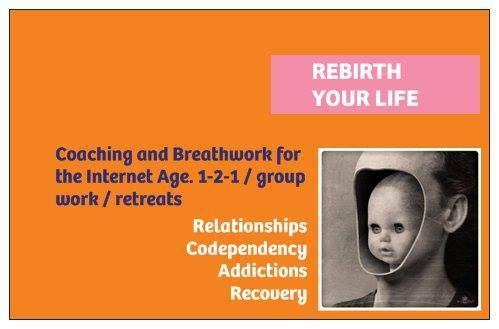 People have asked for a weekday evening slot to experience Breathwork for the first time or maintain what they have achieved already, so I have created some small intimate COACHING/BREATHWORK groups for max of 5 people with a CODEPENDENCY RECOVERY theme. Each 3 hour group session is £30, no more than an evening out these days, but you will feel better for it, working on yourself, instead of working up worry, tension, projection or getting wasted. All for less than £8 a week! I use my own home, my own *womb space* as many have called it, and all monies go to the Urban LIFECLASS pot to bursary our assistants to attend January’s MAROC Retreat in Marrakech. The first 90 mins is taken up with Codependency Coaching in some form, followed by ONE HOURS BREATHWORK that puts you into a total space of relaxation and altered states of consciousness. The remainder brings you down, back into your body, leaving you rejuvenated ready to MOVE FORWARD. It is suggested to do ONE GROUP A MONTH ( a Tuesday or Thursday ) or both if you prefer. This space gives you a chance to get back on track with feelings, emotions and solutions to life problems that appear from nowhere. The aim is to provide 2 BREATHWORK evenings a month . . . More dates and news soon! ← So what happens on a Retreat?